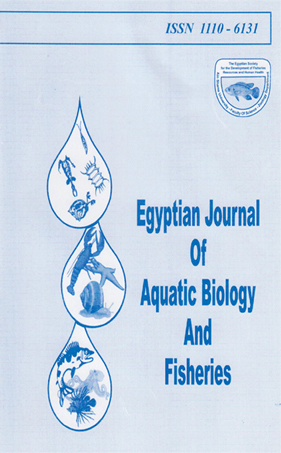 The sea bream Lethrinus nebulosus was sampled during the spawning season of 1996 (May-July) in Ras Mohamed Marine Park. Out of 119 specimens collected (46 females and 73 males), 11 females (23.9 %of examined females) were found to be parasitized by unidentified nematode. This parasite is found to be specific for fish ovary, causing a reduction in the absolute fecundity of the infected females compared with normal ones (averaged 4.97 x 105 and 7.54 x 105 eggs/female, respectively).In all infected females, 2-4 nematode worms of 30-40cm in length / each ovarian lobe, were coiled together in a mass occupying the ovarian lumen and seemed to block the oviduct preventing egg releasing. Histological examination showed that ovaries of heavily infected females did not contain mature ova with a depression of the vitellogensis process. All infected ovaries were characterized by certain degrees of atresia depending upon the level of infection. The synchronization between reproduction of the fish and the parasite, and the parthenogenetic nature of the parasite are thought to increase the biological potential of the parasite to colonize and infect other host individuals and possibly other populations.